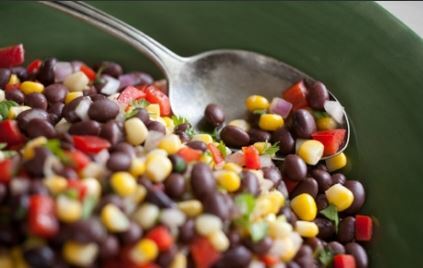 Simple to prepare, colorful and flavorful, this salad combines fresh sweet corn, tender black beans, crisp red peppers and zesty cilantro in a simple rice vinegar dressing. FREEZER: Add all ingredients. Place in a freezer container, and freeze. Thaw before serving. Rinse onions in cold water to remove some of their sharp, acidic flavor; drain well and set aside. In a large bowl, whisk together vinegar, olive oil, lime juice, salt and pepper to make a dressing. Add beans, corn, onion and bell pepper and toss until just incorporated. Cover and chill for about 2 hours. (Frozen corn will thaw during this time. If you don't wait 2 hours, you can thaw corn prior to making salad.) Add cilantro and toss again before serving.